Gypsey Vanner horses (also known as Irish Cob, Colored Cob, Gypsy Cob, Tinker Horse, and Gypsy Horses) originated in the British Isles. 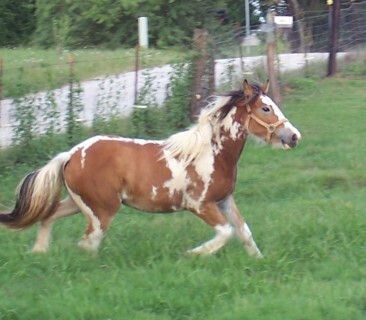 They are a small, solidly-built horse of cob conformation and are often, but not always, piebald or skewbald. They are the only broken-colored horse breed of the British Isles, and are particularly associated with the Pavee and Roma travelling peoples of Britain and Ireland. From about 1850 travelling people in the British Isles began to use a distinct type of horse to pull their vardos, the caravans in which they had just begun to live and travel. The color and look of the breed were refined in the years after the Second World War. Horses of this type were first exported to the United States in 1996. Gypsy Vanner Horses are related to Shire horses, Clydesdale horses, and native British ponies such as the Dales. Gypsy Vanners are not a color breed. They have a heavy body type with heavy bone and broad body like a draft, but short (usually standing 14-15 hands at the withers). Gypsy Vanner horses come in any color, solid, tobiano and splash. They also have an abundance of feather flowing from behind the knees and hocks, as well as a long free flowing mane and tail. In addition they also possess a temperament that is friendly and engaging.